Hello and welcome to the Cameron chronicles. Today I will be talking about my volleyball game podcast. Me and my partner named Scarlett made our podcast about the volleyball game that happened at our school because some people (including me) weren’t at the game because it was the day before February break. The volleyball game was Fifth graders VS teachers and of course the teachers won (even though I think that the teachers cheated because the ref was a teacher. I interviewed my partner Scarlett about what happened and what child teams beat the other child teams. But my class still lost to all the classes and the teachers. Hello and Welcome to the Cameron Chronicles. Today I will be talking about my Rube Goldberg podcast. If you read my seven Rube Goldberg post you would know what the unit was. Then we started our Podcast unit. My first podcast was on my own and was about a feature article that I wrote. my second podcast that I wrote with a partner was about the play Willy Wonka that happened at our school, since I was in the play and my partner Scarlett wasn’t, so she asked me questions about what the play was like and what part I was in. When we made the Rube Goldberg Podcast we had to go back into are research. If you want listen to it press the link below. Please listen to my Rube Goldberg Podcast! 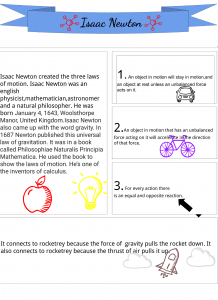 We studied Isaac Newton. 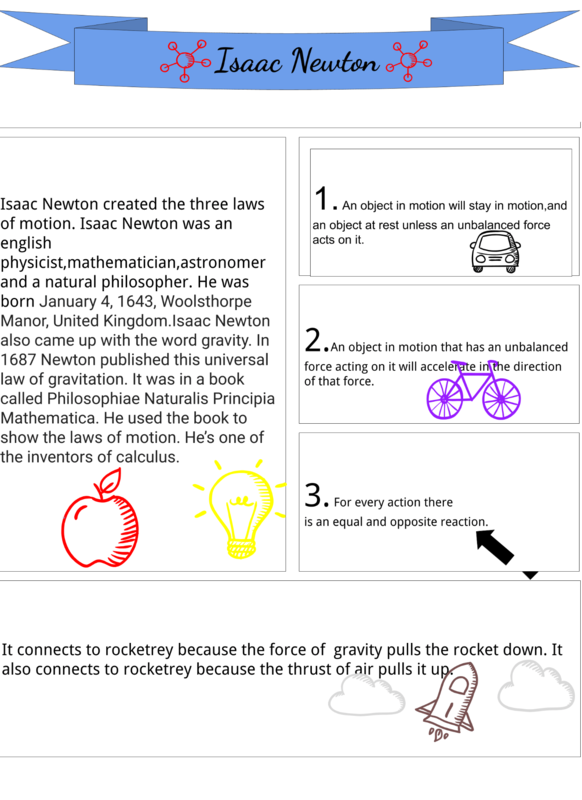 We made an Infographic about his three laws of motion. This is mine. If you can’t read the picture you can just use this link instead. Welcome back to the Cameron Chronicles. Today I will be talking about my Philadelphia trip. On November 9th 2018, the fifth grade went to Philadelphia as a field trip. My Mom was a chaperon on trip. To get there we had to be at school at 5:30 in the morning to get on the bus ride there. The bus ride there was about two and half hours long. On the bus I brought my ipad and a battery charger and also airpods and snacks. When we got there we went to a museum called the National Constitution Center. When we where there we saw two mini plays and two exhibits, one exhibit was about Alexandar Hamiltion and I was actually studying him at that time. The other exhibit was about colonial america which I also really liked. We also got to see the Liberty Bell.Then we went Independence Hall, which was really awesome because we got to see the golden armchair and the room where they planed war. On the way home the bus ride was horrible because there was so much traffic because of rain that instead of the ride being two and a half hours it was four and a half hours. It was also bad because my ipad died and I was so bored. In the end I was so happy that I went on the trip because it was so awesome. Welcome to the Cameron Chronicles. This is my last blog post and then we are finished with our Rube Goldberg project. This project was really fun…but it was also really hard. It was hard because first we had to build the Rube Goldberg( I am guessing you are wondering why that was hard), it was hard because the dominos kept on falling down and then that caused everything else to fall, which was really annoying. Then it was annoying because the marble ramp wouldn’t line up with the dominos( which made everything else not work). Finally, it was annoying because when it got so close and didn’t work we had to put everything back up (It was the most annoying, but we got to take some good timelaspes from that). Once we finally had success we were so HAPPY! Making this Rube Goldberg had a lot of mixed emotions like, when we were sad when we didn’t succeed,but we were happy when did, but all in all. This was an awesome project. The video was hard but we did it it. If you want to watch the video, it is right below. That is all you need to make a Rube Goldberg Movie. Accept some of the videos wouldn’t upload so we had to change computers and sometimes change phones but we eventually got it to work. Read my blog next time to see my summary and my feelings about this fun but hard project. Welcome to the Cameron Chronicles. Today I will be talking about testing the Rube Goldberg machine. The first day was really intense because we had to get the marble to hit the dominos every single time. We also had to change some of steps to get the others to work. We still had to take 12 tries and we still didn’t get it to work. It was also hard to get the marble ramp lined up to hit the dominos. We actually almost had success put then a magnatile fell down and blocked the duck tape roll from hitting the mini basketball in the mini basketball hoop but Scarlett and I will keep on trying until we succeed. Read my blog next time hear about making the wevideo movie. 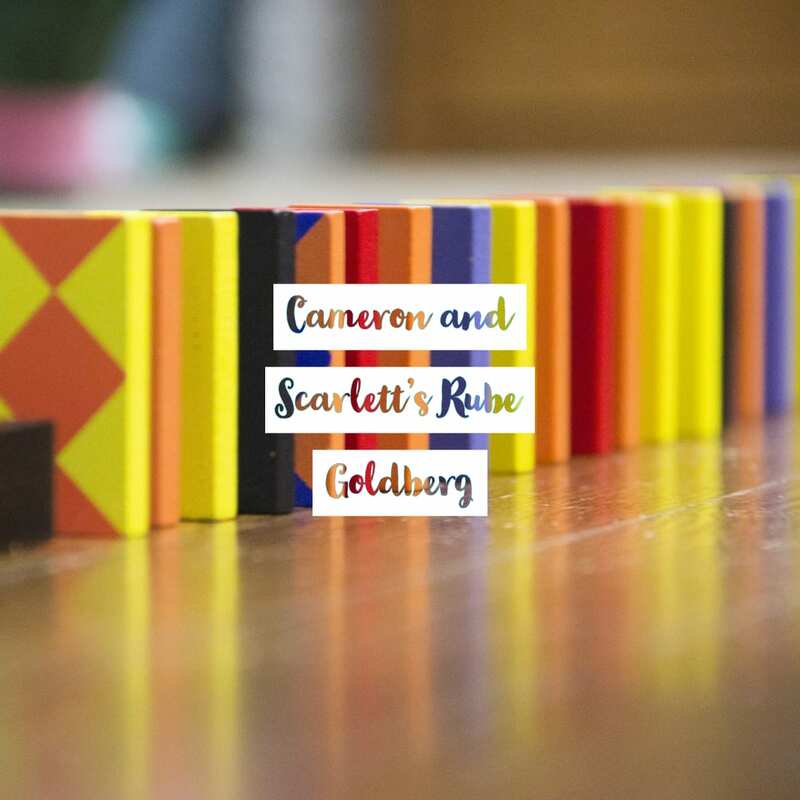 Welcome back to the Cameron Chronicles, today I will be telling you about setting up my Rube Goldberg. When we where setting it up we had to change some things, we had to take away some of the not really possible obstacles. We had to change our sketch because some of the obstacles on it didn’t work, so we changed them. But we have to decide what we want to remove together. It was hard to set the Rube Goldberg up because we didn’t have all the things that we thought we had and that the domino’s and jenga blocks kept on falling down which made everything else fall down and it was not easy to put all of the obstacles back up. But we finally got everything up and tested it twelve times in one day but we still didn’t get it to work so we are going to change it more. We also had to make an improved sketch because we changed so many things. To hear more about my Rube Goldberg read the next post about testing it out. I think it will take 15 tries to get it right. Welcome back to the Cameron Chronicles, today I will be talking about my Willy Wonka Podcast, it was my second podcast . I made it with my partner named Scarlett . I am was the play but she wasn’t, but played Willy Wonka so it helped. First we needed to make our script. We made our script in a interview structure and Scarlett was interviewing me. We also had some other steps, these are them. So now you know how to make a podcast, it is actually really easy to make. If you want to hear it just tap on the link right hear. Willy Wonka Podcast! Welcome back to the Cameron Chronicles, today I will be telling you about working with a partner. It is really nice working with a partner because you can discuss your ideas with each other and choose which of them to use and because you don’t have to to all of the work by your self. My partner’s name is Scarlett and we have been working on this for two weeks and we have been doing really well, we finished are sketch and research, but it was a little hard to make the sketch. It was hard to make the sketch because we had to agree on the materials and what to put in the sketch from are first sketches, which we made separately, but we weren’t sure how to choose, so we took materials and steps from each of our sketches and put them together. When we did that we had to combine are ideas together. 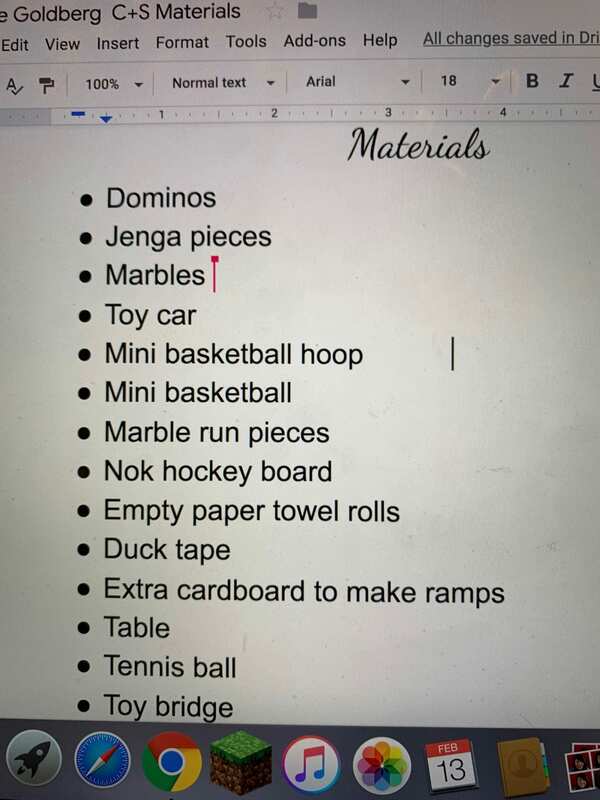 We also had to make a list of materials. It was hard to make the sketch and resource list but we did it and it was fun working together. 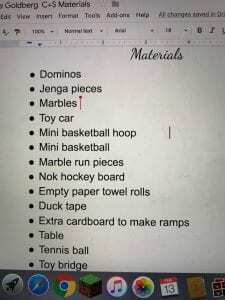 Read my blog again next time to hear about us setting the Rube Goldberg Machine up and how many tries we think it will us to take to get it right.